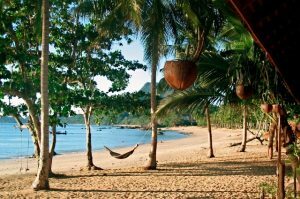 Koh Jum Lodge, Krabi, Thailand - Unique and charming eco-lodge tropical hideway on a long sandy beach of Jum Island. 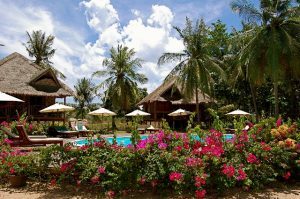 Koh Jum Lodge is composed of nineteen wooden cottages designed in the traditional architectural style and set within a coconut palm plantation and tropical garden setting. 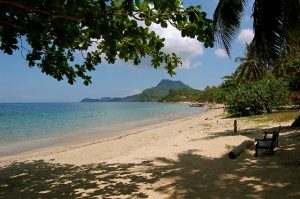 All cottages are located near the beach, facing Phi Phi Island to the West, all benefiting from sunset and Andaman sea view. The “Robinson style” cottages are spacious, 50 square meters plus bathroom, and decorated with local materials such as bamboo, rattan, cotton and silk. Your suite room is equipped with a large king size bed with mosquito net, a large living room corner with sofa and arm chair, a small safe, a bathroom with shower (hot and cold water) and toilets facilities, a large terrace with hammock facing the sea. 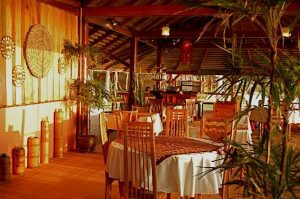 You will enjoy a panoramic sea facing restaurant, with an extension on the beach, offering sea food, Thai and Mediterranean cuisine, a beach bar and a swimming pool. In the tropical garden, for afternoon naps, there are “Salas” and bamboo hammocks, sun beds and a Thai traditional Massage Sala. Dear Jean-Michel, Thank you for the nice days we could spend in your little paradise! It is such a good and lovely place and you look very well after your guests! Thanks a lot! We recommended your place our parents for there next stay here in Thailand and may be we can manage it to come as well for a second time. We would really like it. With warm regards. Julia and Thomas with Felix, UK. Hallo Jean-Michel, we arrived safe in cold Berlin and had to go back to work today. We just watched the nice pictures of our stay at your wunderful place. What a paradise. We enjoyed our stay a lot and have very positive memories. Hope that we´ll find time to visit you again. Kind regards. Hello Mr Limandas. I just wanted to say how pleased we were of our stay at your lovely lodge and island. Back at work in Sweden and telling everyone about Koh Jum and of course of Koh Jum Lodge. Hoping to get the chance to visit you again in a couple years time. Best regards. Hello Jean Michel… we would like to thank you and your staff, your wife and also Thierry having a beautiful stay at the koh jum lodge for a few days. The unspoiled spot, the people and the beautiful scenerie made our holidays just perfect. Greetings from Switzerland. It doesn’t take any effort to settle into the tropical bliss of Koh Jum Lodge, where seaside bungalows are Robinson Crusoe style, with a twist of luxury. 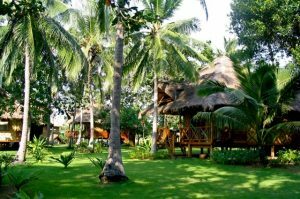 Exquisite woodwork and artistically thatched roofs give no hint that this resort was once destroyed by the wave. Mrs Julie, Calgary Herald - CANADA. Hi Jean Michel. I Wanted to send you this photo and tell you again how much we enjoyed our stay at Koh Jum. As I suspected when we left, our stay with you was the highlight of our 7 week trip. Thanks again and we hope to see you again. We will highly recommend the Koh Jum Lodge to all of our friends who visit Thailand. See all photos, click here. More information on rates & conditions. Jum Island is also spelt Koh Jam, Koh Cham, Ko Jum, Ko Jam, Ko Cham and known as Koh Pu or Ko Pu. 286 Moo 3, T. Koh Siboya, Nua Klong district, Krabi 81130, Thailand. 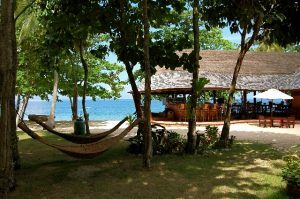 The Koh Jum Lodge is situated on the unspoiled island of Koh Jum (or Koh Pu), between Krabi, Koh Lanta and Phi Phi islands. Nineteen cosy cottages in traditional Andaman style are set in a natural coconut plantation and tropical gardens. 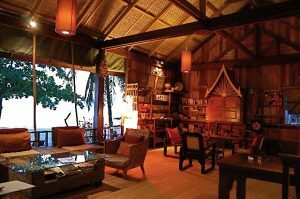 The Koh Jum Lodge is a Thai eco-resort with a natural individual charm. © 2018 by kohjumlodge.com All Right Reserved.